Mission Grove E17. Yet again. Yesterday. Was cyclist Sharon Corless killed by 4X4 driver using a mobile phone? The 42-year-old from Woolston was struck by a Range Rover Sport at 10.52am near to the roundabout at the junction of the A50 Kingsway North and Farrell Street. The mother-of-three died from multiple injuries at Warrington Hospital where she worked as a support worker in women's and children's services. The 35-year-old woman driver of the vehicle was arrested following the smash amid claims she may have been using her mobile phone at the time. Police have confirmed that they are looking into the possibility that the driver may have been using her phone at the time of the accident. One of Britain's biggest energy suppliers has been fined more than £4,000 after putting pedestrians' lives at risk. EDF Energy was found to have created a 30-metre trench without putting up diversions. People were left to walk on a busy road. ‘Kev’, a commenter on Moving Target, has posted two brilliant videos of The dangers of Upper Thames Street (scene of two cyclist fatalities). They underline what a dangerous city London is for cycling in, where crap design interacts with traffic-choked streets, motorists indifferent to cyclists and cycling facilities and criminally dangerous driving. 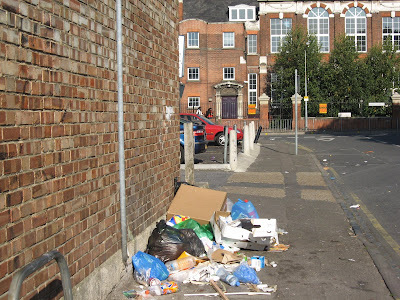 The approach to Mission Grove primary school from Walthamstow High Street, yesterday. 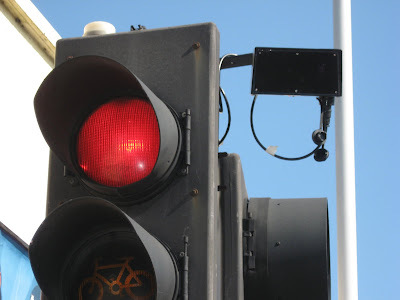 The figures, from the mayor's office, show that since 2004 a total of 379,862 overseas-registered drivers have been filmed on CCTV committing motoring offences in London. But only 36,226 of them have been brought to book and made to pay their fines. This sign on a pole on Leyton Green Road helpfully gives cyclists with X-ray vision advance warning of a mystery destination on the exciting 'London Cycle Network'. 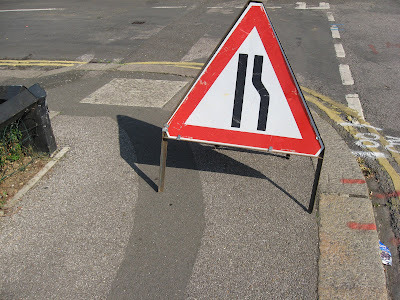 (Below) This sign on Wingfield Road E17 provides all road users with directions to an easily-missed road on the right. Walthamstow’s top tourist attraction is perhaps The Ancient House, which as you can see from this photo is in delightful surroundings! (Above) Saturday 27 September. To see the amazing improvement just scroll down to the last photo here taken a month ago on Saturday 23 August! Vernon Road E17, just off the High Street, Saturday lunchtime. 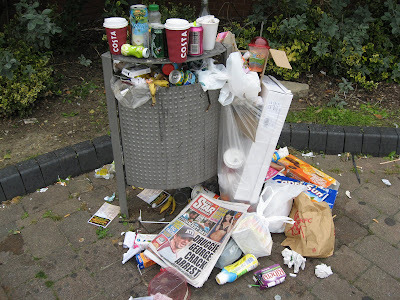 Whichever trader is dumping crap here on a regular basis every Saturday is still doing it. 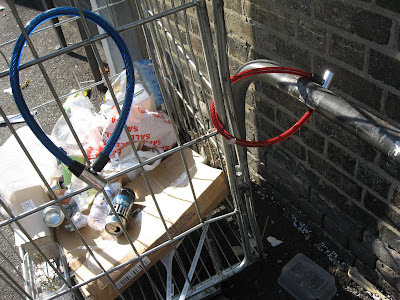 Exmouth Road E17. 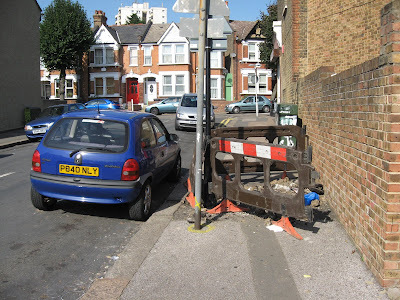 There's no way a wheelchair user or someone with a double buggy would get through the gap left by this inconsiderately placed sign (put there by the contractors who are digging up the streets of London to replace the water mains). Tate Modern. There's vast amounts of empty space round the building and there's car parking. But no cycle stands, that I could see. This afternoon. "She must be the stupidest driver of the year." 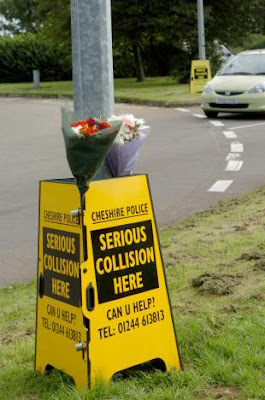 A female cyclist has died and her husband has been seriously injured in a road accident in Cheshire. A Range Rover Sport was in collision with the couple on the A50 Kingsway in Warrington on Saturday morning, before crashing into another car. Cheshire Police said the cyclist, a 42-year-old local woman, and her 46-year-old husband were taken to hospital, where she later died. A woman has been arrested. A teenager stabbing another teenager to death with a knife is BIG NEWS. Teenagers being killed by motor vehicles is as natural as rain and no cause for concern. A 14-year-old girl has died after she was hit by a van on Saturday afternoon in Aberfan, Merthyr Vale. Crap design (example 273). 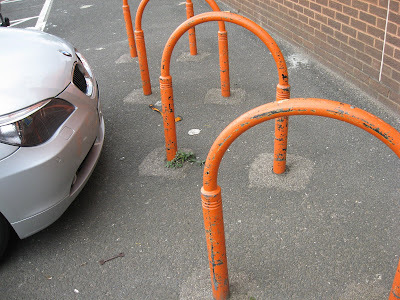 There is no protection for cycles at the cycle stands outside the B & Q store on Lea Bridge Road. Vehicles can come as close as they want to. Which means that sloppy white van man might give your bike a bash. 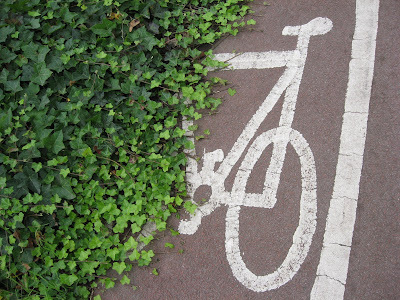 Cycle facilities are getting greener all the time. This is another section of the award winning Orient Way cycle lane. A stopped driver caught in the rally refused to wait, reversing, then accelerating into at least two riders. One bicyclist, whose leg was run over, said the driver was irate and aggressive, shouting at the cyclists for blocking his way. The driver, whose identity has not been released, later said he panicked and did not intend to hit any riders. Riders waylaid the man's Subaru station wagon as he tried to drive from the scene, police said. The driver was dragged from the car and hit in the head with a bicycle lock before police arrived. praised the Prosecutor's Office for "thoroughly investigating allegations" against the men, but had harsh words for the Seattle Police Department for, in his view, failing to investigate the driver for vehicular assault. "I'm disturbed that the Seattle police made it clear that they were not taking that seriously," Hildes said. "It's a very scary thing when a motorist is going to use his vehicle as a deadly weapon against people who are delaying him for a matter of seconds." In initial statements after the incidents, police said the driver was clearly the victim in the case. Prosecutors are expected to drop criminal charges on Friday against a bicyclist who was pushed off his bike in July by a police officer in Times Square, said Mark M. Taylor, a lawyer for the bicyclist. The encounter was captured on amateur video. The bicyclist, Christopher Long, 29, was charged with attempted assault, resisting arrest and disorderly conduct on July 25 during a monthly ride called Critical Mass. The arresting officer, Patrick Pogan, wrote in his report that Mr. Long had been weaving in and out of traffic and that he had tried to hit the officer with his bicycle. Tensions have long existed between Critical Mass riders and the police, who complain that the riders ignore traffic laws. DEMONSTRATORS will march on the Town Hall to protest against proposals to build a multi-million pound waste processing plant where they live. 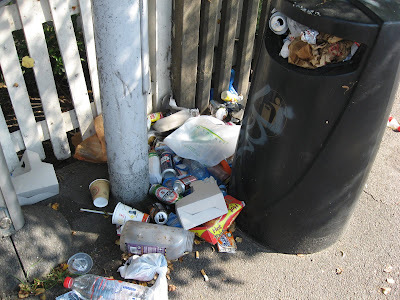 Campaign group Residents Against Pollution (RAP) is angry that the Blackhorse Lane area of Walthamstow has been chosen as a possible site for a waste management facility, which includes an incinerator or hazardous waste-processing facility as part of the North London Waste Plan (NLWP). 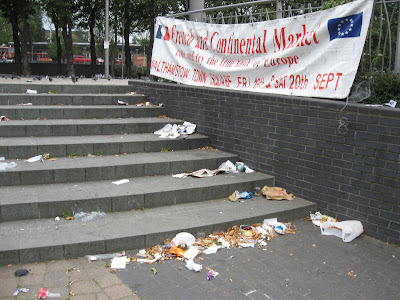 RAP members, who will demonstrate on the steps of the Town Hall in Forest Road, Walthamstow, on Tuesday, claim that there are plans to expand the incinerator in Edmonton. The NLWP, which were drawn up by seven boroughs and announced in November last year, says six new processing plants are needed in north London and half of the proposed sites are in Waltham Forest. Sandy Simpson, 61, was only yards away from her home when she was run down by the unnamed officer travelling at nearly twice the speed limit and using his blue lights. He had been given permission to leave the station to deliver a card to his sister. It was on the way back, where a mobile data terminal recovered from his car showed that he was doing 57mph on a 30mph road when he hit Mrs Simpson in Bromley, Kent. At one point on his drive from his home in Swanley, Kent back to the station he topped speeds of 100mph. The officer, 23, lives with his parents and younger sister, reports have said. Another report says that the officer treated a relative to a high-speed 'black run' tour of the local area - again with blaring siren and emergency lights. The cycle lane, Forest Road (heading towards Tottenham), junction with Blackhorse Road. 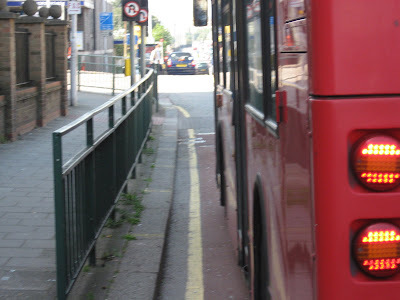 The bus driver has chosen to obstruct the cycle lane rather than go into the outside lane. The ASL looks to be free of traffic. I could squeeze through the gap, but I wouldn't. I might collide with a pedestrian crossing in front of the bus. 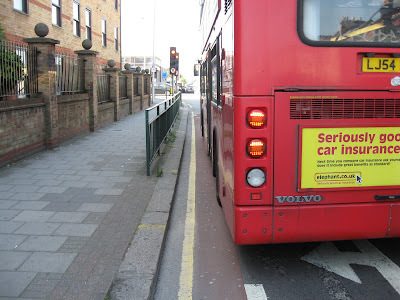 Or the bus driver might suddenly drift even further into the cycle lane. Or the lights might change, leaving me trapped beside an accelerating bus. If planners are going to put cycle lanes at sites like this they should physically segregate them from motor traffic. And Advanced Stop Lines need to be much, much bigger. 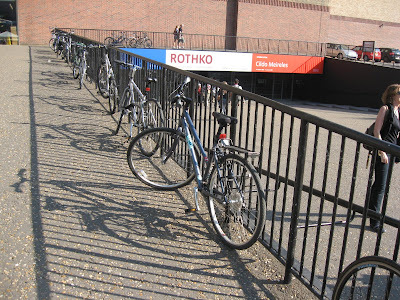 Another problem is the railings. They are a death trap for cyclists. Anyone in the cycle lane who is hit by an overtaking vehicle is just going to slam against the railings, bounce back and go under the wheels. 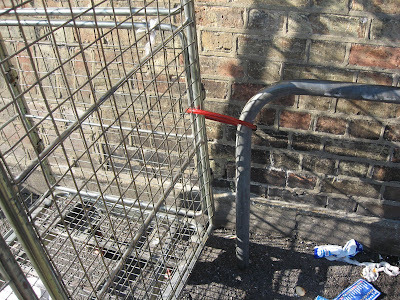 Railings like these are opposed by pedestrian campaign groups, who resent the traditional highway engineer's cattle fence approach to managing walking. But they are even more deadly for cyclists. 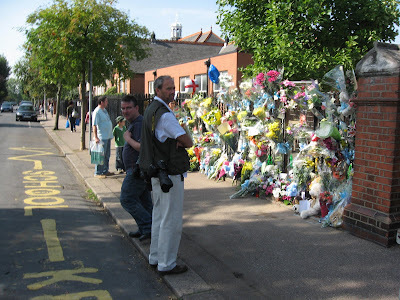 The only real justification for railings is at very limited sites such as school entrances, where they may prevent a child impulsively dashing across the road. Everywhere else they should be torn up and got rid of - especially at major road junctions. Footnote. A new website has just been set up by a group of London cyclists concerned by the latest fatalities. It is devoted to safer cycling and you can find it here. 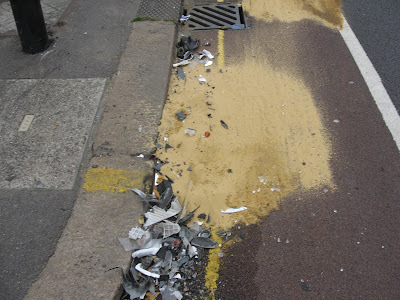 About 90 per cent of the crap left in the cycle lane on Forest Road after Wednesday’s two crash crash has been swept up. The rest, including broken glass, hasn’t. It has been redistributed. One-way streets are proliferating in Greater London. The reason is to make motor traffic flow more smoothly. 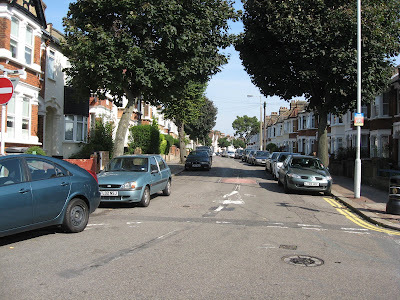 In the London Borough of Waltham Forest more and more residential streets are being converted to one-way, because as vehicle ownership levels increase streets are filling up on both sides of the road with parked cars. The gaps where drivers could once pass no longer exist. But every new one-way system represents the theft of road space from cyclists. 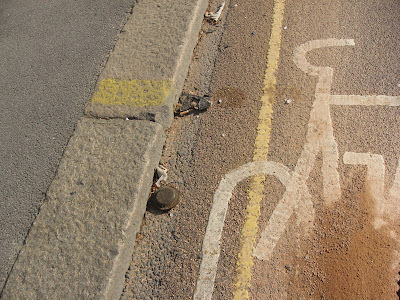 The convenience of cyclists is only very rarely considered by highway engineers, who are generally obsessed with motor vehicle flow and car parking. Pedestrians are also paying the price of increasing vehicle ownership (which is often the result of affluent households acquiring three or four vehicles), as more and more pavements are exempted from the pavement parking ban, to accommodate the parking of more cars and bigger cars such as 4X4s. These thoughts are prompted by an item in last week's local paper. Abuse from cyclist who was going the wrong way is one of the headlines on the letters page of The Waltham Forest Guardian (September 18). 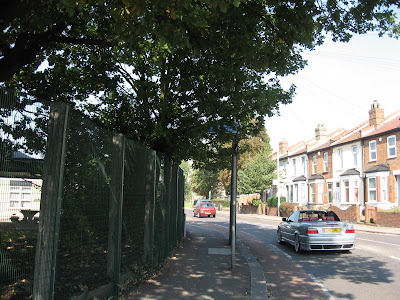 I was driving down Selwyn Avenue, Highams Park, towards the school, and coming towards me on the road was a cyclist. I flashed my lights and called “You’re going the wrong way.” All I received was loud, violent and abusive language, tamest of which was “so what!” finalised with a filthy spit onto my thankfully closed window. Don’t they have to follow the same rules of the road as other road users? Perhaps the bikes ought to require MOT certificates, insurance and indeed, a road tax disc just as car users do. Now let’s assume that this incident occurred just as the driver said it did, and let us condemn the cyclist for his or her offensive response. But let’s look at the wider context. Why was this section of Selwyn Avenue designated one-way? 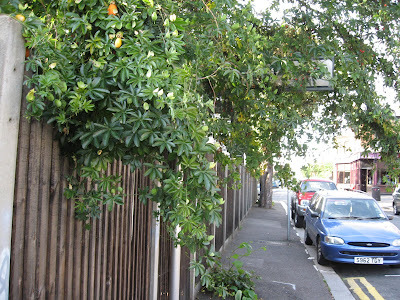 Answer, because both sides of the street are lined with parked cars, put there by residents who lack off-street parking. This creates problems for two-way traffic, as there isn’t room for two cars to pass. The borough’s highway engineers therefore designated it a one-way street. But cyclists nowhere came into consideration. Cyclists who had always cycled along this stretch of the road in this direction suddenly found that their journey was illegal. Selwyn Avenue is where two dedicated cycle routes meet. The Chingford ‘quiet route’ allows cyclists to cut through the road closure on Nelson Road E4 and continue along the first section of Selwyn Avenue. They then encounter NO ENTRY signs. 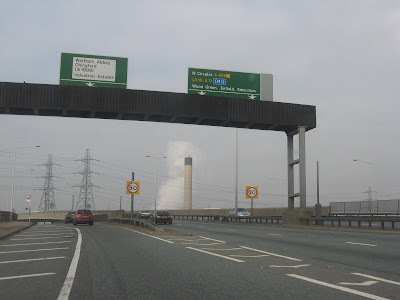 (See photo below) Other cyclists can come from the dedicated cycle route beside the greyhound stadium and the Ching. If you are heading for the local station, Larkshall Road, The Avenue or Hale End Road, then this section of Selwyn Avenue provides the quickest route. The Council encourages cyclists to use quiet routes and then puts NO ENTRY signs in their way and expects them to go a longer way round. But why should cyclists, when further along their route is Winchester Road? That is a horrendously narrow, fast, dangerous road to cycle on. There is no rational reason why cyclists should not ride along Selwyn Avenue against the one-way system, since there is as much space between a bike and a car as on many two-way roads in the borough. The one-way system is in reality design discrimination, which prioritises car parking and car movement at the expense of the convenience of cycling. It’s the same logic which degrades pavements for pedestrians by exempting them from the pavement parking ban, for the sake of residents who want to own cars and have no off-street parking. London is crammed with design discrimination of this sort but it is rarely recognised as such. The solution, of course, is to allow cyclists by law to use ALL one-way street in the 'wrong' direction. There is almost always room for a cyclist and a car to pass safely, and with a little goodwill on both sides the same goes for lorries and cyclists. One-way streets usually require traffic calming anyway, so vehicle speeds are slow. Drivers would, of course, require educating in this new law, and should be obliged by law to slow where necessary and give way to cyclists. The person who wrote to the local paper displays the characteristic complacency of a certain kind of driver. Since there is ample room for a cyclist to pass in the one-way section of Selwyn Avenue it is not clear why the driver felt obliged to flash his lights and shout at the cyclist. Secondly, the driver gives his address as a road about a mile away and says he was driving to the nearby school (perhaps to collect a child). The driver accepts this as the natural course of things. All I see there is the complacency of a motorist who thinks a one-mile car journey puts him at the centre of the transport universe. There is of course one final bitter irony to this letter. On the same day it was published, complaining about a cyclist on Selwyn Avenue, a resident of this same road climbed into her Toyota Land Cruiser, drove it round the block, and crashed into the entrance of the local primary school, killing baby Finlay Woods. 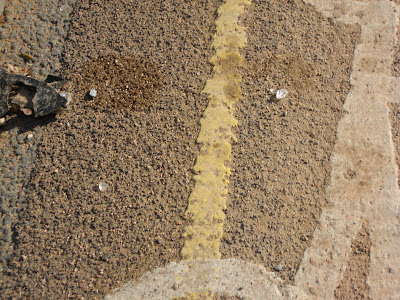 Those drivers who write angry letters complaining about cyclists show very little sense of perspective, and expecting all cyclists to obey the rules is optimistic where road lay-outs discriminate against their safety and convenience and when drivers flout the rules of the road with impunity, to far more deadly effect. Which planet is Bob on? Update at 1 p.m. : There is nothing about this death on BBC Ceefax London news. The only cycling story is headed Cyclists urged to slow down in parks, a story repeated on the BBC London news website Celebrity dog owners Jenny Seagrove, Felicity Kendal and Maureen Lipman are urging cyclists to ride carefully in parks to avoid colliding with dogs. The Standard’s only cycling story today is also tied to celebrity: Former England football star Ian Wright had his bicycle stolen - yards from the spot where Conservative leader David Cameron had his taken in July. ITN Teletext London news has nothing. As far as these media outlets are concerned it appears yet another killing of a London cyclist by a lorry driver is not regarded as newsworthy. And while trawling the net to see if there was any news on today's fatality I came across stories of cyclists killed on Thursday and Friday. Doesn't look like The Standard is going to mention it. And the only thing that has changed is BBC Ceefax London News has changed its headline to Dog-lovers call for safer cycling. In other words, more flat earth news. On the rare occasions I watch the BBC TV breakfast show I am always struck by how much prominence is given to 'war on the motorist' stories and how the grinning presenters assume that 'we' all drive cars, 'we' all hate speed cameras and traffic wardens, and 'we' have all clocked up tickets for speeding. It turns out that the cyclist who was crushed to death by a lorry in central London yesterday was a woman, not, as originally reported, a male cyclist. Today’s Standard has a report, though it’s largely ripped off from Moving Target, with the photograph nicked from the ITN London News bulletin. 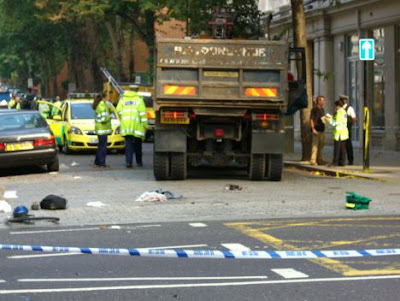 In 2005, 20 cyclists were killed and 338 injured on London's roads. In 2006, 18 were killed and 349 injured and last year 14 died and 253 were injured. More than half of those killed are involved in accidents with lorries and experts fear the death toll could rise as construction lorries pack London's roads in the build-up to the 2012 Olympics. A Transport for London spokeswoman said cycle deaths since the Nineties were down 19 per cent despite a 91 per cent increase in cycling. The TfL spokeswoman is an idiot. Cycling becomes safer the more people cycle and achieve a critical mass. So logically she should have said 'because of' not 'despite'. However, the statistic she quotes is a very dodgy one, since it refers to commuter cycling on selected major London routes. It does not hold true for London in general. In Waltham Forest in the daytime I can cycle for miles and never see another cyclist. That only changes early in the morning or in the early evening, when commuter cyclists appear. And declining casualty figures do not necessarily mean that roads are becoming safer (that myth was demolished once and for all by Robert Davis in Death on the Streets). Women cyclists are far more likely to be killed by a lorry because, unlike men, they tend to obey red lights and wait at junctions in the driver’s blind spot, according to a study. The report by Transport for London’s road safety unit was completed last July but has been kept secret. It suggests that some cyclists who break the law by jumping red lights may be safer and that cycle feeder lanes may make the problem worse. Moving Target has more on cyclists and lorries and some practical advice and suggestions here. As far as I can tell BBC News has shunned this story. Absurdly (but quite consistent with the theory that its top journalists have racked up scores of tickets for speeding and parking offences) it is making a major story out of the fact that a man in Sunderland is challenging Sunderland council’s parking enforcement on a technicality. Even though this is a Sunderland story, the BBC thinks this is London news. AN accident closed Forest Road in Walthamstow in both directions (Tuesday). The two-car crash at 9am between Woodstock Road and Hale End Road caused major delays as traffic was diverted through side streets. A 39-year-old man who was trapped in a car was cut free by firefighters. 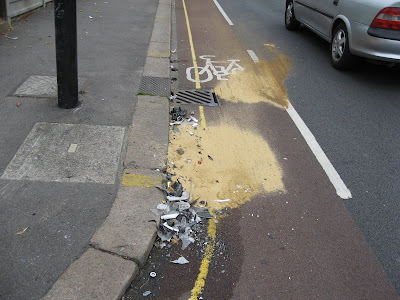 When I pedalled past all that was left was a residue of wreckage, which had been thoughtfully left scattered in the cycle lane. It was the puncture-inducing variety, full of sharp fragments. Judging by the sand the collision took place in the cycle lane, which means that if a cyclist had been passing when these two cars collided the cyclist would probably have died or suffered serious injuries. I don't know what happened but it may be significant that two lanes of fast moving traffic shrink to one lane at this point, which means that drivers jockey for first place. A driver in the slow lane runs the risk of being cut up by a driver in the fast lane, and the only place left to go is the cycle lane. 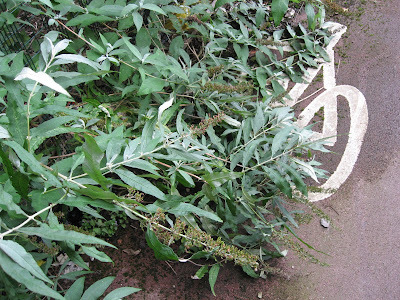 The council’s own figures suggest that cycling numbers on Forest Road are in decline, which may be a reflection of the fact that this is a road which is risky and unpleasant to cycle on, where hundreds of drivers break the speed limit every day, and scores more can be seen chatting on their mobiles. Forest Road needs speed cameras along its entire length, but plainly nothing is going to be done until there is a really spectacular crash which kills lots of people. 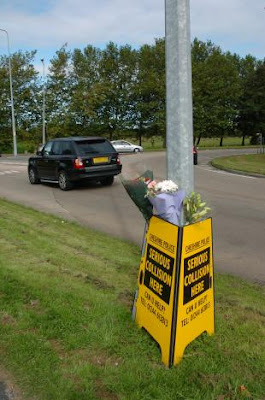 Ironically, yesterday’s crash took place beside the black pole which used to support a speed sign which flashed at drivers exceeding 30 mph. This sign was removed without explanation some years ago, presumably for repair, and has never been put back. The kind of negligence you’d expect from a crap council like the London Borough of Waltham Forest. Unusual features in the Borough's cycle network include a traffic light-controlled cycle filter at the Blackhorse Road/Forest Road junction. This halts all other traffic, allowing eastbound cyclists 10 seconds to get ahead of the traffic or to turn right without having to weave across three lanes. On Friday I pedalled this way from Tottenham. I waited at the cycling lights, which were at red. The other lights went to green for motorists. I waited. Still red. The lights went back to red for drivers. 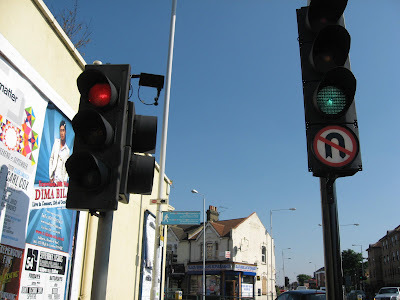 The other lights for drivers on Blackhorse Road and Blackhorse Lane went to green. Then the lights for the drivers to my right went to green. The cycling light stayed red. And then the lights for drivers went to red. And my light stayed red. And the lights for drivers on Blackhorse Road and Blackhorse Lane went to green. And I realised the light for cyclists was never going to go to green. Maybe the sensor is broken. I'd wasted five valuable minutes at a dysfunctional facility. So then I had the challenge of cutting across a lane of left turning traffic and slotting myself in among three lanes of impatient drivers. 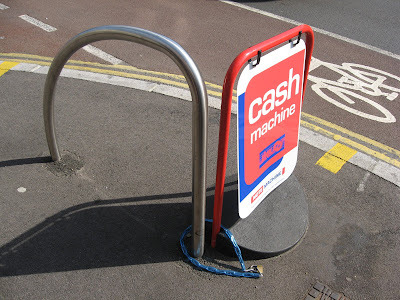 Cycling in Waltham Forest? It's bloody marvellous. 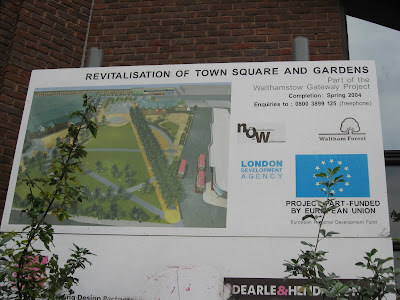 As you enter the borough from Tottenham on the A503 you pass a sign which marks the borough boundary, proudly stating that Waltham Forest is the birthplace of William Morris. 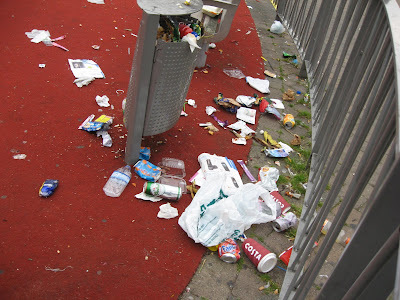 Then there's a bus stop, with a shelter and... an unemptied litter bin. Yes, Kier are skimping on the job from one end of the borough to the other. 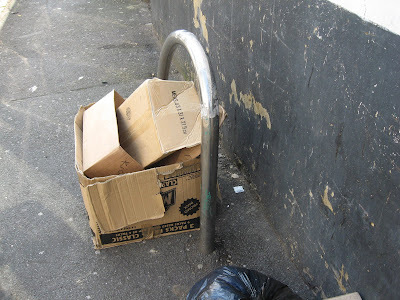 I very much doubt if this bin gets much use, so it has probably been in this condition for weeks. 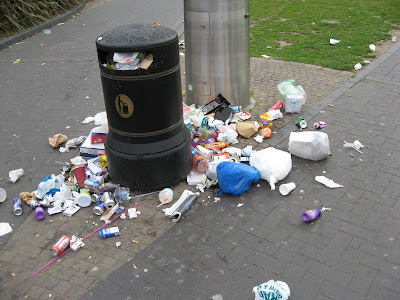 And it was just as bad on the other side of the bin (see pic below). 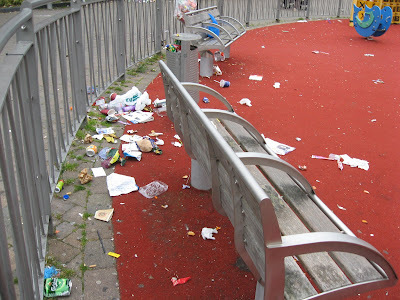 Anyone visiting the shopping mall yesterday and arriving from the bus station or the tube/overground had to walk past this. 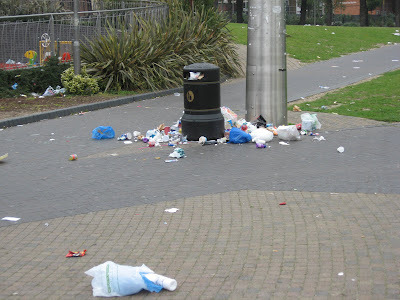 Rubbish is still piling up on the streets of Waltham Forest. 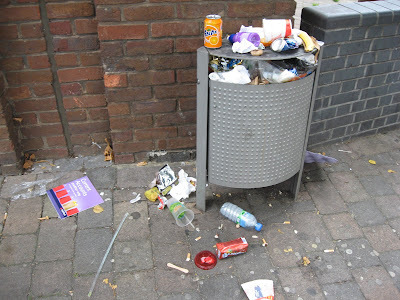 Just two weeks ago we revealed how anger towards Kier Street Services, the organisation which is paid by the council to keep our neighbourhoods clean, was mounting by the day. Some residents claim their streets have become so infested with uncollected rubbish, they have had to grab brooms and sweep them themselves. And in an area where the average Band D tax payer forks out £1,440 a year in council tax, local people have threatened to withhold payment and have fired off petitions to the local authority. 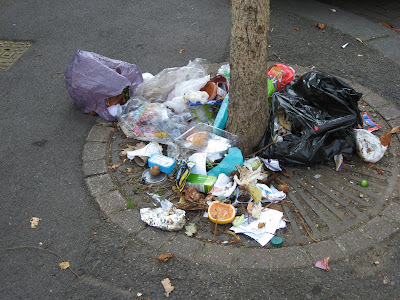 In response, environment councillor Bob Belam declared earlier this month: “No part of the borough will be ignored or passed over in our efforts to make Waltham Forest a cleaner place.” But Kier are still doing a sub-standard job and the Guardian has demanded Cllr Belam lives up to his promise. 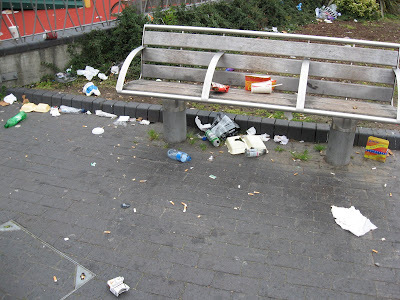 (Below) Who wouldn't want to sit down in the Town Square and relax and absorb the local atmosphere? If you feel like communicating with one of your ward councillors, the email addresses of London Borough of Waltham Forest councillors are listed here. 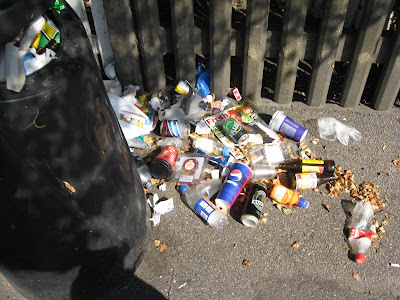 (Below) Another overflowing bin, on the bus station side of the Town Square, by the bank. 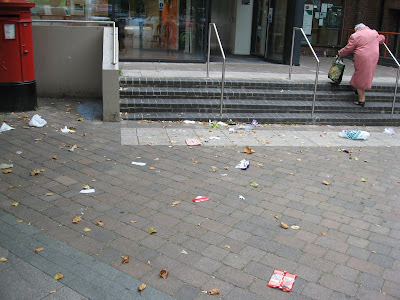 (Below) Litter strewn across the entrance to the central library and the post office. Katie Gutierruez-Perez is the obvious answer. But there’s a wider context of responsibility, which I think no journalist, politician or police officer will be at all interested in discussing. Channel Four admires the way the Land Cruiser is designed for toughness and durability and for coping with the world's most difficult terrains. In other words, nobody in London needs to drive one of these monsters. 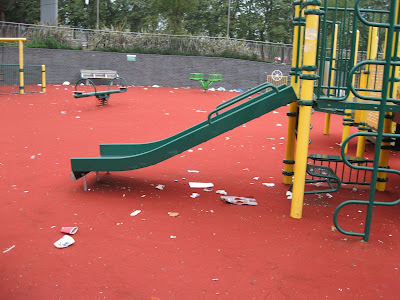 But the government has done nothing at all to discourage their use in totally unsuitable urban environments (either by an outright ban or through punitive taxation). As we descend from the brow of the hill we are effectively in free fall. All the antilock braking, traction control and we'll-take-care-of-it-sir software in the world won't stop the Toyota from head-butting the earth's crust. Big time. And it does. But it's hardly surprising. We are on a course designed to take the new Land Cruiser to the edge of its capabilities. It is Toyota's way of reminding us that the 51-year-old Land Cruiser legend has been built on its ability to keep going regardless. Nearly 4m have been sold globally and it has been exported to 127 countries — including China, where it is called Shamowang, or King of the Desert. 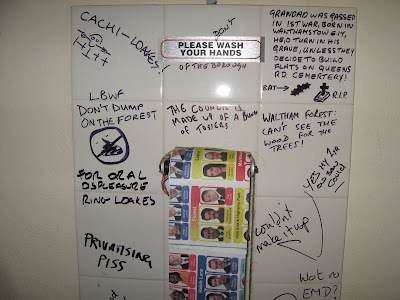 In Latin America the imaginative locals call it El Macho. much more refined. At 80mph wind, road and mechanical noise are remarkably low for such a big machine. The performance from the 161bhp turbodiesel is also up to the task — 0 to 62mph in 12.7sec, 106mph top speed — and all that low-rev poke delivers a relaxed drive. Even the BBC (an institution which is no friend of cyclists, pedestrians or safe roads) gives the Land Cruiser a plug. The road lobby, in other words, is keen to see many more Toyota Land Cruisers on our roads. 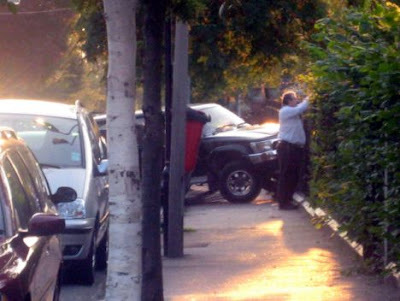 In the London Borough of Waltham Forest Councillors Clyde Loakes and Bob Belam are also working towards this objective, by converting more and more pavements to car parks in order to accommodate residents who choose to acquire larger and larger cars but have nowhere else to park them but the street. Roads policing activity, like other aspects of police operations, is open to public scrutiny. Currently it has two specific performance indicators within the Policing Performance Assessment Framework (numbers killed and seriously injured compared with vehicle kilometres travelled and satisfaction with the way incidents are dealt with, including for victims of road traffic collisions). Those are grossly inadequate ways of measuring what is in reality a disastrous failure in policing our roads. Law and order has effectively broken down on our roads but no politician or senior police officer is particularly concerned. The number of traffic police in England and Wales fell from 7,525 in 1999 to 6,511 in 2006, a reduction of 13 per cent. The number of breath tests carried out fell from 765,000 in 1999 to 578,000 in 2004. This is a classic statement of the confusion and prejudice which informs policing of our roads at the very highest levels. Note that as far as Manning is concerned ‘the public’ does not include cyclists. Such attitudes continue to the present day. Later this year the Association of Chief Police Officers and the Police Federation are hosting a conference on ‘Roads Policing – the Wider Picture.’ (PDF) Among the speakers is Mike Farmer, Regional Director, Road Haulage Association. There is no one representing cyclists or pedestrians - but then the police have never been very interested in enforcing laws which protect these vulnerable groups. There are no speakers from RoadPeace or Brake. The ‘wider picture’ of this conference will in fact be very narrow indeed. Incredibly, the Met yesterday announced a further reduction in its traffic police. Knife crime has overtaken terrorism as the No 1 priority for the Metropolitan Police, one of Britain’s most senior officers said yesterday. Deputy Commissioner Sir Paul Stephenson announced the formation of a special knife-crime unit to address the recent spate of fatal stabbings in London as he admitted that moves to stop teenagers carrying weapons were not working. The dedicated 75-strong task force will be made up of officers from the Territorial Support Group, traffic and dog sections and specialist detectives. Earlier this year, Sir Ian Blair, the Metropolitan Police Commissioner, had said that only terrorism posed a greater threat than youth violence to London. Sir Paul’s announcement came after a 16-year-old boy became the eighteenth teenager to die a violent death in the capital this year. There were 26 youth murders in 2007. In reality the greatest established threat to Londoners comes not from terrorists or youths with knives but from drivers. Terrorists and youths with knives are pathetic underachievers compared with motorists. Don’t expect any discussion of this in our media. Pedestrians will continue to die on Britain’s pavements, hit by reckless drivers who 'lose control'. Cyclists will continue to be run down or crushed by reckless and inattentive drivers. Business as usual. 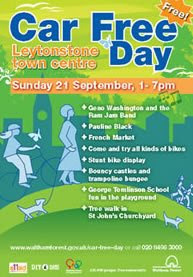 In Waltham Forest, Car-Free Day takes place on Saturday rather than on Sunday as elsewhere. The borough's Cycling Officer, Gina Harkell explains this is because it has "more impact on cars. Sunday is a quiet day and much easier to close roads on, but is obviously less effective." London's biggest free cycling event this weekend. Olympic gold medal winners will be among an estimated 50,000 cyclists at the Sky Sports London Freewheel on Sunday when some of the City's most famous roads are closed to motorists. Participants will cycle past landmarks such as the Tower of London, Houses of Parliament and Buckingham Palace. One thing does surprise me though. Sky Sports London Freewheel is free but participants must register in advance. 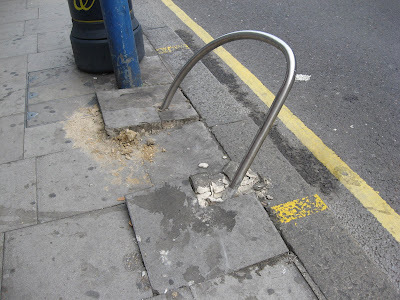 Why should anyone have to register in order to cycle through central London? Does this mean unregistered cyclists who turn up will be turned away by surly stewards? Last year I posted a couple of comments about the local car free day here and here. The council took my criticisms to heart, and as you can see from the photograph below (taken this week, in that delightful section under the Lea Bridge Road bridge) there has been an enormous improvement in the condition of the prize-winning Orient Way cycle lane. 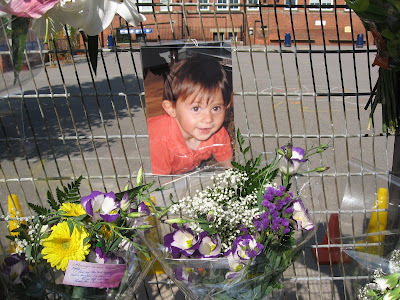 The woman who crushed a baby to death when she drove her 4X4 on to the pavement outside Selwyn Primary School in Highams Park has now been charged with a series of motoring offences. Tina Woods, 31, was pushing her 15-month- old son Finlay in his pram when a black Toyota 4x4 careered towards them. She was hit from behind and collapsed against a pillar, bleeding from a head wound. 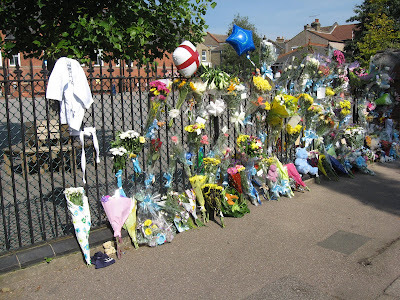 When she looked up, she saw the pram wedged between the vehicle and the gates. Horrified witnesses said the 4x4 repeatedly rammed into the gates, each time crushing the pram further. Eventually it stopped and around 20 parents and neighbours battled to lift the vehicle off the baby outside Selwyn Junior School in Highams Park, East London.Paramedics arrived within minutes and took the baby to hospital with his mother, but doctors told her his head injuries were so severe that there was nothing more they could do. A senior Old Bailey judge is being questioned by police today [Friday] after being involved in a car crash that left a cyclist in hospital. Judge Brian Barker QC, the Common Serjeant of London, the second most senior position at the criminal court, was on his way to work this morning when the collision happened. His top-of-the-range Saab, complete with personalised number plates, was in contact with the cyclist yards from the court entrance. The cyclist was taken to University College Hospital with shoulder injuries, while the judge, a father of three, was spoken to by City of London police officers. A force spokesman said: "We are investigating a road traffic collision involving a car and a cyclist at the junction of Ludgate Hill and Ava Maria Lane. The incident took place at around 8.30am. There have been no arrests and details have been taken." 64 per cent of women said they never cycle, according to an online survey commissioned by Cycling England. Women were concerned about safety with 53 per cent citing it as an issue, and 42 per cent said they lacked confidence in their own road skills to navigate the UK's congested roads. Only 2 per cent of women said they cycled everyday. A BABY has died after being hit by a car that swerved off the road outside a school. A black 4X4 Toyota hit 15-month-old Finlay Woods before crashing into the railings of Selwyn Primary School, in Cavendish Road, Highams Park. The 39-year-old woman driver has been arrested at the scene on suspicion of causing death by dangerous driving, drink driving and driving while unfit through drink or drugs. Witnesses, many of whom had gathered to pick up their children from the primary school, described the horrifying moment when they saw the baby trapped underneath the Toyota. According to an anonymous witness who comments on the story in today’s Standard the woman driving totally took out the school gates and barrier on the pavement plus had damaged other cars on the road. Witnesses said the man, in his twenties, was knocked off his bike and crushed under the front wheel of a lorry turning left from Kensington High Street at about 9.20am. Two hours earlier, another cyclist was killed when he was hit by a heavy goods vehicle in Upper Thames Street. This is the 8th London cyclist to have died as the result of a collision with a HGV/LGV/lorry in 2008. There's a narrow cycle lane at this site on Upper Thames St with lots of metalwork in the ground. Additionally there are bollards along the edge of the pavement and often pedestrians waiting to cross. That all adds up to any cyclist using the (far too narrow) cycle lane having NO escape route whatsoever. Expecting all but the tiniest minority of motorists to have any concept of allowing an escape route for other vehicles not even in the same lane is naive in the extreme. We shall have more and more HGVs on London's busy roads leading up to 2012, and drivers are STILL killing cyclists and getting away with derisory fines, and blind spot mirrors are STILL not compulsory for HGVs. The other part about this particular cycle lane is that it restricts the roadway and should never have been put in the first place, the road is too narrow for the addition of 'restricted' road space. It then forced all the motorcycles that previously shared the centre space between rows of traffic with bicycles to use the new cycle lane perched at kerb; the latter being on particularly poor repair. We must encourage more cyclists to make the roads safer, enforce existing road traffic laws and clamp down on killer drivers. Thanks for covering this story, though why last Monday's fatality on Holloway Road (where a female cyclist was hit by a lorry) or last Friday's on Blackfriars Bridge (where a female cyclist was hit by a lorry - and survived with serious injuries) were not deemed newsworthy by yourselves seems strange to say the least. Especially given your give cyclists room campaign. Maybe it's the two in one day that made them newsworthy? A COMMUNITY campaigner was killed when her bicycle was crushed under the wheels of a cement mixing lorry on Islington's most dangerous road. Lisa Pontecorvo, 64, of Thornhill Square, Islington, died on Monday at the junction of Holloway Road and Fieldway Crescent - on a dedicated cycle crossing a few hundred metres north of Highbury Corner. Over at Moving Target, Buffalo Bill has more information about today’s fatality, with comments and links, here. Update Friday 19th: a range of comment and suggestions in today’s Standard. Lorry drivers should be made to watch footage of fatal bicycle accidents in a bid to reduce the number of riders killed on the roads, it was claimed today. More from 'The State of the Borough' on the E17 Art Trail. Janet Wright's exhibition mourns the loss of library stock. 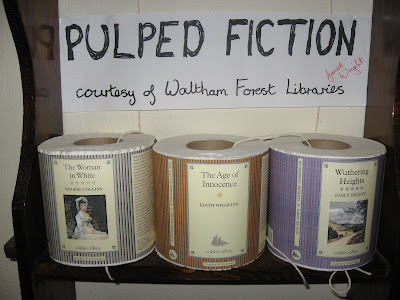 "When the council reorganised the libraries between 60,000 and 160,000 books were sent to the recycling plant for pulping. The recycling plant was overwhelmed by the volume of books and resorted to burning them in the incinerator." Elle MacPherson has been criticised by health and safety officials for letting her son sit on the handlebars of her bicycle as she rode him home from school. Jo Stagg, from the Royal Society for the Prevention of Accidents, said: "It is both illegal and dangerous. A child on the front handlebars could affect the cyclist's ability to see, steer and balance, and we would not advise parents to carry children in this way - ever." So-called "double riding" can be punished by a fine of up to £2,500 in exceptionally dangerous cases. Whereas a driver killing a cyclist can result in a fine of just £300 or £500 (payable in instalments), killing two people earns a fine of £700 and killing four people merits a fine of £1,000. Texting while driving is riskier than driving under the influence of alcohol or drugs, a study has suggested. The Transport Research Laboratory found that motorists who use their mobile phone to send text messages while on the road dramatically increase the likelihood of collision. Their reaction times deteriorated by 35 per cent, much worse than those who drank alcohol at the legal limit, who were 12 per cent slower, or those who had taken cannabis, who were 21 per cent slower. In addition, drivers who sent or read text messages were more prone to drift out of their lane, the research found, with steering control by texters 91 per cent poorer than that of drivers devoting their full concentration to the road. Stephen Glaister, director of the RAC Foundation, which commissioned the research, said: “No responsible motorist would drink and drive. We need to ensure that text devotees understand that texting is one of the most hazardous things that can be done while in charge of a motor car.” Despite it being illegal for a motorist to use a handheld phone behind the wheel, the RAC Foundation said that nearly half of British drivers aged between 18 and 24 admitted to texting on the roads. Yet only 144,000 people were prosecuted for using their mobile while driving last year. Will Gordon Brown announce immediate action to legislate and save hundreds of cyclists and pedestrians from being killed in the future by texting drivers? Will David Cameron attack the government for its complacency and inaction? Will senior police officers announce a massive programme of enforcement, akin to the resources put in to policing the climate change demo in Kent? No of course they bloody won’t. Road violence is institutionally acceptable. Lea Bridge Road, opposite the library. 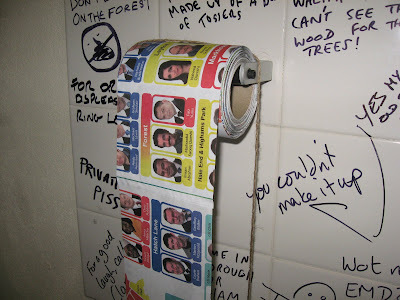 The councillors of the London Borough of Waltham Forest, on a toilet roll. Modern art - I love it. Apparently this particular exhibition is so popular its run has been extended to Saturday. Enjoy. Spot the rat and win a prize! It’s a four star world! Why don’t the police raid Audi?